Discover the Protected Landscape of Vallebrón in Fuerteventura. 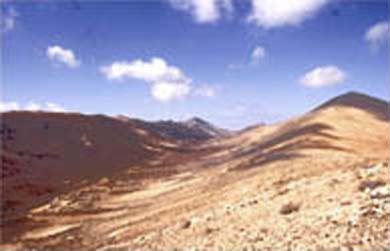 The Vallebrón Protected Landscape is located in the municipalities of La Oliva and Puerto del Rosario, at approximately 30 kilometers from the touristic centre of Corralejo in the island of Fuerteventura. This protected landscape is characterized by a precious relief, with a relevant landscape value. Moreover it also has scientific importance due to the animal wild species living here. The most oriental peek of the Vallebrón corresponds to the well-known Muda Mountain where there’s a small archaeological site with a very peculiar burial system.